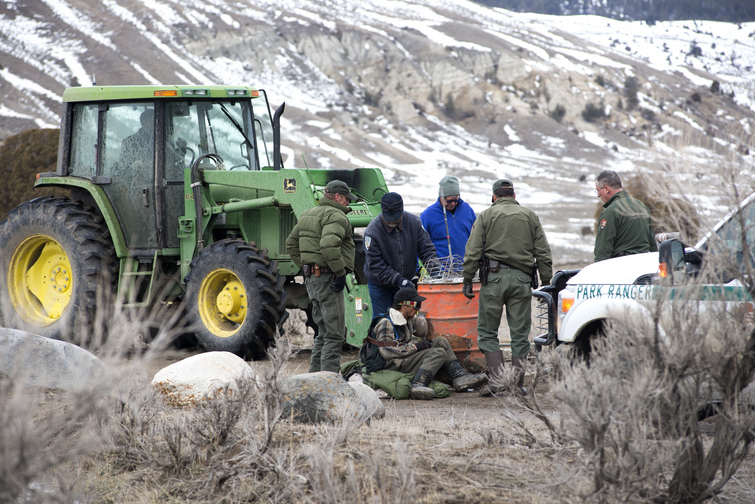 YELLOWSTONE NATIONAL PARK: Comfrey Jacobs appeared in U.S. federal court today for his first arraignment after being arrested for blocking the road to Yellowstone National Park’s bison trap on Thursday morning, March 6, 2014. Mr. Jacobs was charged with three offenses: disorderly conduct, breaking a closure, and interfering with a government operation. He was offered a plea bargain: if he plead guilty he would be charged $1,000 in restitution, be placed on unsupervised probation for five years, and be banned from Yellowstone National Park for five years. Mr. Jacobs did not accept the plea bargain, as he is awaiting further legal council. There will be a continuation of his arraignment on April 2, 2014. If Mr. Jacobs chooses to go to trial, he will be tried by a judge and not a jury of his peers. The goal of Comfrey’s decision to block access to Yellowstone’s bison trap was to prevent more of America’s last wild, migratory bison — the most important bison population in the world — from being shipped to slaughter. Mr. Jacobs stalled slaughter operations for more than two hours. Comfrey’s action demonstrated strong public opposition to the buffalo slaughter and has drawn an incredible amount of media and public attention to the issue. The day following Mr. Jacob’s blockade, Yellowstone National Park issued their only press release for this year’s controversial bison operations, announcing that the Stephens Creek bison trap was empty and Yellowstone had no further plans to capture this season. “My action raised enough public awareness that Yellowstone announced a cease to their operations the following day,” Mr. Jacobs said. This was the first time a citizen exercised civil disobedience at Yellowstone’s Stephens Creek bison trap. Yellowstone National Park initiates a 7-mile public access closure surrounding their Stephens Creek bison trap while highly controversial bison management activities are underway. Members of Buffalo Field Campaign were present to document and lend support. Since February 7, approximately 450 wild buffalo have been captured in Yellowstone National Park’s Stephens Creek bison trap, located in the Gardiner Basin. 318 were shipped to slaughter or research facilities and some were released. Additionally, more than 270 wild bison have been killed by state and treaty hunters just outside Yellowstone’s boundary in Montana. Through hunting, slaughter and consignment to research, more than 600 of America’s last wild, migratory bison have been eliminated this year, marking a decimation of the world’s most significant bison herds. Yellowstone and its partners in the Interagency Bison Management Plan (IBMP) have set an arbitrary population target of 3,000-3,500 bison, yet a Yellowstone bison carrying capacity study has determined that the Park can sustain upwards of 6,200 wild bison. Additionally, there are tens of thousands of acres of public lands surrounding Yellowstone that could sustain thousands more. The wild bison of Yellowstone are the most significant bison populations in the world, the direct descendants to the tens of millions that once thundered across North America. Wild, migratory bison are ecologically extinct throughout their historic range with fewer than 4,000 existing in and around Yellowstone. They are the only bison to hold their identity as a wildlife species. North America’s largest land mammal, wild bison are a keystone species critical to the health and integrity of grasslands and prairie ecosystems. The zero-tolerance bison politics of Montana’s livestock industry are driving the policies that are pushing these significant herds back to the brink of extinction. This is also the first year that IBMP-affiliated tribes have signed slaughter agreements with Yellowstone, and have shipped bison to tribal slaughter facilities. YELLOWSTONE NATIONAL PARK: When livestock trailers arrived to Yellowstone’s Stephens Creek bison trap this morning, they found the access road closed. 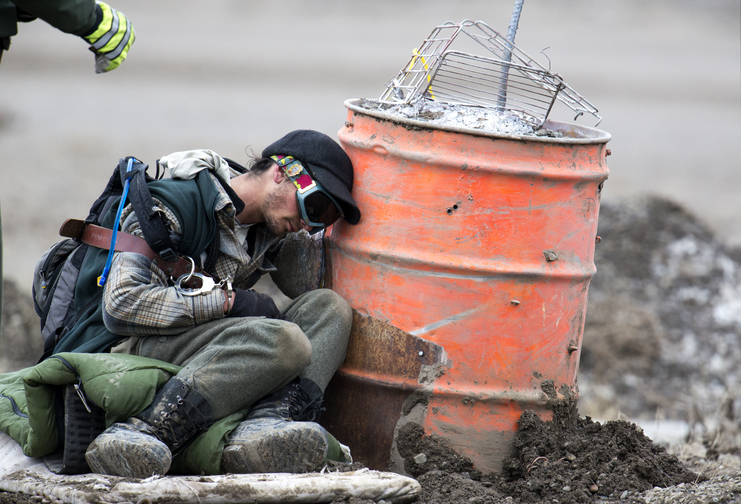 Twenty-year old Comfrey Jacobs risked his physical well-being and personal freedom by blocking the access road to Yellowstone National Park’s Stephens Creek bison trap. His goal was to prevent more of America’s last wild, migratory bison — the most important bison populations in the world — from being shipped to slaughter. Members of Buffalo Field Campaign were present to document and lend support. Video footage and photos are available upon request. Comfrey’s action stalled transport to slaughter operations for more than two hours. Baffled for some time, Park Service employees eventually brought out a front-end loader and moved Comfrey and his blockade off of the road. The stalled livestock trailers then entered the road and headed to the trap to load wild bison for transport to slaughter. Comfrey was still locked into his concrete-filled 55-gallon barrel when three trailers, now full of America’s last wild buffalo, left. Around 10am, a welder released Mr. Jacobs and he was then arrested and taken into custody by the Park Service. Mr. Jacobs was taken to Yellowstone’s jail in Mammoth and later released. He has been charged with disorderly conduct, breaking the Stephens Creek closure, and interfering with a government operation. While Comfrey’s action may not have stopped buffalo from going to slaughter today, he was able to demonstrate strong public opposition to it, and has drawn an incredible amount of attention to the issue. This is the first time a citizen has exercised civil disobedience at Yellowstone’s Stephens Creek bison trap. Since February 7, approximately 450 wild buffalo have been captured in Yellowstone National Park’s Stephens Creek bison trap, located in the Gardiner Basin. Most of the buffalo have been and will be shipped to slaughter, while some are going to government research facilities. Nearly 320 bison have been shipped to slaughter and 250 more have been killed by hunters. Yellowstone National Park initiates a 7-mile public access closure surrounding their Stephens Creek bison trap while highly controversial bison management activities are underway. Yellowstone National Park has also been uncharacteristically secretive this year: Superintendent Dan Wenk is the first Yellowstone superintendent to prevent his staff from disclosing information to the public. After Buffalo Field Campaign patrols saw the livestock trailers leave the Park, they called Yellowstone’s public information officer, who said no information would be provided until Monday. Wild bison are currently managed under the highly controversial state, federal and tribal Interagency Bison Management Plan (IBMP), which is heavily influenced by Montana’s livestock industry. American citizens and others world-wide have have largely opposed all the actions carried out under the IBMP, but concerns for the buffalo have been ignored. Under the IBMP, more than 4,650 wild bison have been senselessly killed or otherwise eliminated from these last wild populations. The wild bison of Yellowstone are the most significant bison populations in the world, the direct descendants to the tens of millions that once thundered across North America. Wild, migratory bison are ecologically extinct throughout their historic range with fewer than 4,200 existing in and around Yellowstone. They the only bison to hold their identity as a wildlife species. North America’s largest land mammal, wild bison are a keystone species critical to the health and integrity of grasslands and prairie ecosystems. The zero-tolerance bison politics of Montana’s livestock industry are driving the policies that are pushing these significant herds back to the brink of extinction. This is also the first year that IBMP-affiliated tribes have signed slaughter agreements with Yellowstone, and are shipping bison to tribal slaughter facilities. “We need to attack Montana’s intolerance and the IBMP, not the buffalo,” said BFC co-founder Mike Mease. “I believe year-round habitat in the Greater Yellowstone Ecosystem and Montana is the solution for wild bison population management, not genetically damaging and limiting the herds through slaughter or constant harassment and abuse through hazing operations,” Jacobs said. Jacobs said he is aware of the repercussions of his actions, bur felt strongly that he needed to draw attention to what Yellowstone National Park is doing so that they are held accountable for their direct participation in bison mismanagement, which has lead to the decimation of America’s last wild bison populations.